Pound for pound the best coach in college basketball might be Michigan’s John Beilein. You can make arguments for Mike Krzyzewski, Jay Wright, Roy Williams, John Calipari, and Tom Izzo. Those guys have won the national championship. Krzyzewski, Wright, and Williams have multiple titles. But when it comes to maxing out talent, basketball IQ, and player development, Beilein is as good as any coach we’ve seen. No. 2 Michigan (17-0, 6-0 Big Ten) is off to its best start in school history. Could anyone have predicted that the Wolverines would be among the final two unbeatens left in the sport? (Virginia is 15-0). If they win Saturday at Wisconsin, they will likely be No. 1 in next week’s Associated Press poll. A year after losing in the NCAA title game to Villanova, Beilein has possibly his greatest team. This might be his best chance to win his first national championship. The Wolverines are 31-1 over their past 32 games, including 8-1 versus ranked teams, with 24 double-digit victories. This season, four of those double-digit wins are against Villanova, North Carolina, Purdue, and Indiana. Michigan is vying to be the No. 1 overall seed for the NCAA Tournament. Its dominance was on full display last weekend when the Wolverines vaporized Northwestern 80-60. At a first-football school, Beilein is trying to deliver the program’s second national championship. The team has played in the national title game four times (1992, 1993, 2013, and last year) since the 1989 championship. The 2012-13 team featured six NBA players, but this might be as complete a team as Michigan has ever had. This might not have ever happened if Beilein bolted for the NBA. Last summer, the Detroit Pistons pursued him. In the pros, it’s harder to succeed because so much is out of a coach’s control. In college, Beilein has considerably more authority to mold his team his way. The coach has had health issues. In August, Beilein underwent double-bypass heart surgery. 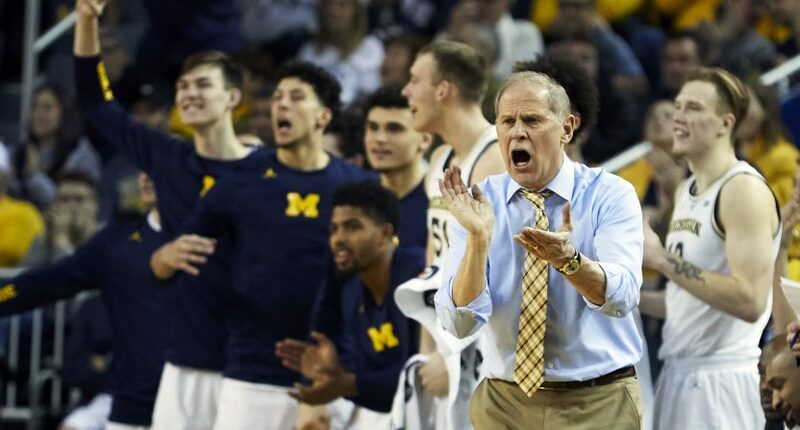 Beilein, who will turn 66 years old next month, is Michigan’s all-time leader in coaching victories (265) and is under contract through the 2022-23 season. For most of his career, Beilein has been known as an offensive tactician and is notoriously secretive about his methods. Lots of back-door cuts, three-point shots, and precision passing. But over the past few seasons, the Wolverines have been a defensive terror. This year, they’re third in defensive efficiency and third in fewest points allowed (56.6). Some of the credit can be given to assistant Luke Yaklich whom Beilein hired in spring of 2017. What should be alarming to the rest of the nation? Beilein’s offense hasn’t even kicked in yet. The Wolverines are 76th in field goal percentage (47.1) and 71st in three-point shooting (36.7). They made strides against Northwestern, shooting 52 percent, including 11-for-27 from beyond the arc. This is clearly not the same kind of Michigan squad that hung 92 points on Oklahoma State to open the 2017 NCAA Tournament. But this team relies upon balance with three starters averaging at least 13.4 points and six players averaging 8.0. Four have totaled 20 points in a game: freshman forward Ignas Brazdeikis, senior guard Charles Matthews, sophomore guard Jordan Poole, and junior point guard Zavier Simpson. They have multiple players who play multiple positions and are adept at handling the ball. The key might be Simpson. When he plays at his highest level, Michigan’s offensive flow is considerably better. Simpson had a career-high 24 points, four assists, three steals, and no turnovers against Northwestern. Michigan is gunning for its third national championship game appearance in seven seasons. Last year’s ride took some luck. The Wolverines needed Poole’s desperation heave to advance to the Sweet 16 and thwart Houston’s upset attempt. This team was expected to be good but was picked second in the Big Ten behind Michigan State and No. 19 in the preseason Associated Press poll. Beilein has made his career about exceeding expectations. He has taken four different schools to the NCAA Division I tournament (Canisius, Richmond, West Virginia, and Michigan). He has enjoyed remarkable success, especially since he has never worked at a basketball-first major-conference team. How long can Michigan stay perfect? Saturday’s game at Wisconsin starts a stretch that will see the Wolverines playing six of its next 10 on the road. That will include trips to Indiana and Iowa– both currently ranked. After that, they will play archrival Michigan State twice over their final four regular-season games. Michigan figures to lose at least a few times before the start of the NCAA tournament. However, when March Madness starts, the Wolverines might be the safest bet to reach the Final Four. And maybe Beilein will finally get that national championship.